A major figure in the positive-consciousness dancehall movement, Jamaican DJ/toaster Super Cat was born William Maragh in a ghetto section of Kingston known as Cockburn Pen or Seivright Gardens (the same area that produced DJ stars like U-Roy and Prince Jazzbo). Interested in music from a very young age, Maragh was touring Jamaica with various sound system organizations by the time he was a teenager. His first DJ name, Cat-a-Rock, was eventually switched to Super Cat due to the former's resemblance to the word "cataract"; he also earned a secondary nickname, the Wild Apache. Super Cat made his recording debut in 1981 with the single "Mr. Walker," recorded for the Techniques label and produced by Winston Riley. A succession of singles for various labels followed, as did his debut album Si Boops Deh, which appeared on Techniques in 1985. Settling for a short time on the Skengdon label, Super Cat recorded another album, Boops, but soon grew dissatisfied enough with the business aspect of recording to start his own label, Wild Apache Productions. The self-produced album Sweets for My Sweet followed in 1988, as did a number of singles produced for other artists on the Wild Apache imprint; Super Cat also teamed up with Nicodemus and Junior Demus for the first triple-team DJ album in dancehall history, Cabin Stabbin'. Emboldened by success, Super Cat decided to move to New York City and attempt to crack the American market. He secured a major-label deal with Columbia and landed the track "Nuff Man a Dead" on their compilation Dancehall Reggaespanol; in 1992, he issued one of the first major-label dancehall albums, the acclaimed Don Dada. Several high-profile TV and concert festival appearances followed, and Source magazine named Super Cat their Dancehall Artist of the Year for 1993. The following year, he reunited with Nicodemus and Junior Demus, adding Junior Cat to make the resulting album The Good, the Bad, the Ugly, and the Crazy a four-way collaboration. Super Cat's own fusion of dancehall, roots reggae, hip-hop, and R&B was next showcased on the proper follow-up to Don Dada, 1995's The Struggle Continues. While the album was another success, Super Cat really raised his profile in the pop mainstream with his guest shot on Sugar Ray's 1997 smash "Fly," which prominently featured his toasting skills. 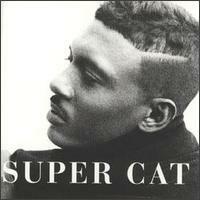 Columbia capitalized on the resulting exposure in 1998 with the singles compilation The Good, the Better, the Best of Super Cat.